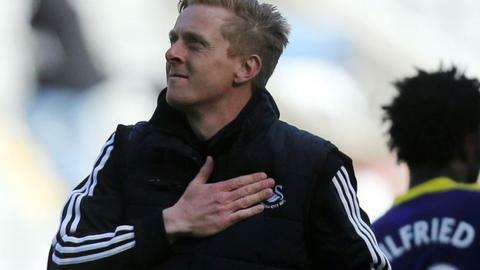 Garry Monk will meet the Swansea chairman Huw Jenkins this week to finalise terms on a deal expected to see him appointed as permanent manager. Monk took over under the title of head coach from Michael Laudrup in February, guiding the club to Premier League safety with two games to spare. Contract talks are expected to start early this week. Club bosses hope to confirm the appointment before Sunday's final game of the season at Sunderland. Since taking over Monk, 35, has seen his side win four, draw three and lose six of their Premier League games. Swansea lie 13th in the table after losing 1-0 to Southampton at Liberty Stadium on Saturday. After that match, Monk commented about his role at the club: "Nothing's been confirmed. "They [the board] said they would confirm it [the manager's role] before the end of the season, so that means there's a week left and obviously sooner will be better rather than later." Swansea secured a place in the Premier League next season when they beat Aston Villa 4-1 on 24 April. Monk joined the Swans as a player in 2004 when they were in League Two under former boss Kenny Jackett and became captain two years later. He made 260 appearances for the club, scoring seven goals. Monk had preliminary talks with Jenkins in the week leading up to the match with Southampton, and it is understood no other candidate has been spoken to by the club.